Traditional jacket in a new style. Colour anthracite. Suede look. Crease-resistant, visually very close to the leather but significantly less sensitive. 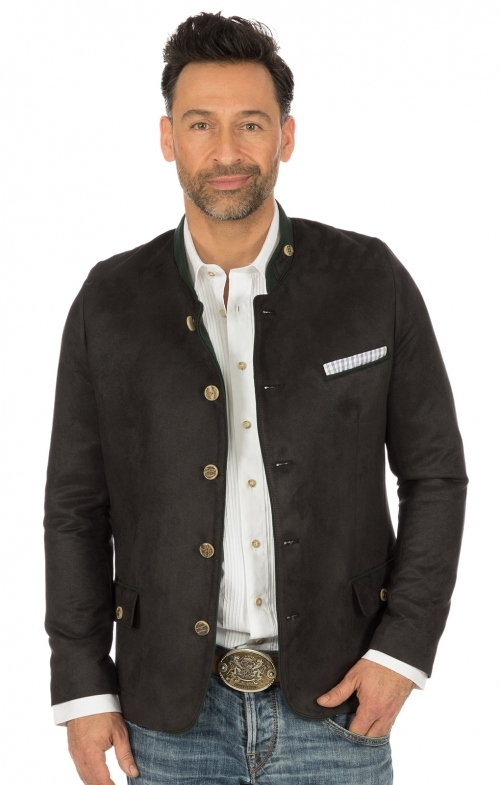 This is how the new traditional jacket comes in a slim fit from Orbis. Subtle equipment. Collar mirrors, pocket piping and jacket edges are made of fir-green-coloured fabric and adapts discreetly to the style of this young and casual traditional joker. The small buttoned bow tie on the collar is eye-catching and the stag horn buttons are of course genuine. The handkerchief with the modified breast pocket is fashionable detail. A cardigan to fall in love. Traditional, young and unique. Qualität und Verarbeitung sehr gut. Passform entspricht der bestellten Größe. Lieferung, wie von Alpenclassics gewohnt, sehr schnell. Immer wieder gerne zum Einkauf bereit.